deepavali or diwali the festival of lights is performed well in chennai. 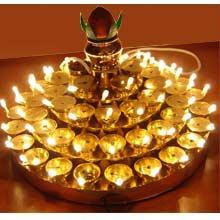 Satyam IT company declared thursday and friday holidays on diwali day and the next two days are also holidays as usual. All the software guys, gals almost freshers or eltps have rushed to their hometowns on this occasion on wednesday afternoon. festive mood seen in every body's face. It is understood that the sales of fire crackers are not that much . But many stalls are opened in every street. subhiksha grocery store is also selling firecrackers. All the children started firing crackers in the morning of thursday itself. All streets, colonies resounded with fire cracker, bomb sounds. Streets are full of firecracker debris. 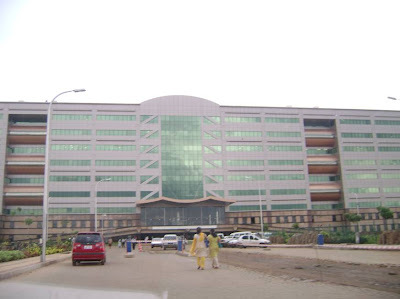 Chennai is growing into a major IT city, after bangalore. you can see one of those IT center . These IT cities or parks are providing lots of employment to youth. Old mahabalipuram road is full of IT companies and their traffic. 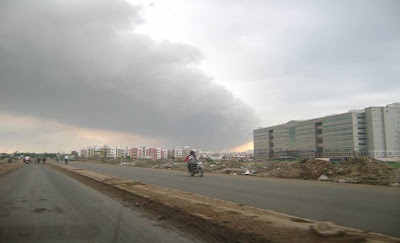 This picture is near lifeline hospital junction, from velachery. The omr road is renamed as Rajiv gandhi road recently by chief minister karunanidhi. 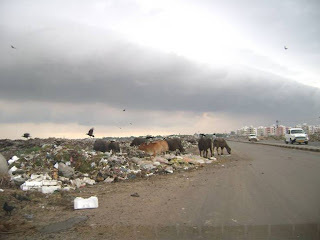 Though chennai is a beautiful city, there are some places where unscrupoulously garbage is dumped and the city look is changed here.This place is pallikaran reserved forest area near velachery. You can see when you are approaching cityline hospitals on old mahabalipuram road, to reach your software . companies. 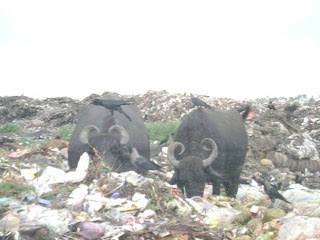 See how buffaloes and crows are enjoying this garbage. This places really stinks too while you pass in a bus with closed windows. Chennai traffic is increasing day by day. Though it is an interesting sign, the regular travellers feel difficulty in travelling on the roads. Many traffic signals stop the flow. The worst thing is bus drivers are not following the traffic rules. They just jump any signal , without any hesitation. They run fast their mighty buses just on left edge of road, encroaching onto walkers. 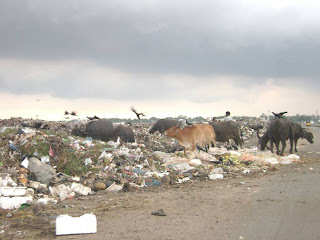 Government has to take some steps to curb this.